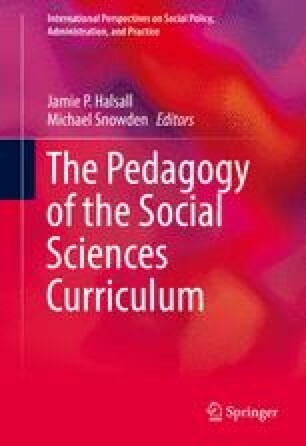 The chapter explores the multiple identities students and lecturers bring with them in to the lecture room. Using Hall’s notion of Translation (The question of Cultural Identity, Hall. 1992) and Appadurai’s five segments of adjustments (Disjuncture and difference in the global cultural economy, 1990): Ethnoscapes, Technoscapes, Financescapes, Mediascapes and Ideational to explore the issues and identifying the challenges for educators delivering a community development curriculum to students with multiple identities. The author presents a model drawing on the values and Principles that underpin UK Community Development encompassing , the following the individual, group, society, organisation, and international spheres. The model presented represents a living curriculum designed and adapted in a way paralleling the debate on diaspora with the themes presented as both fixed points, to meet institutional regulatory requirements and as autonomous spheres that are influenced by each other and open to translation by the students engaging in the programme.